Those suffering from the physical deformity called genu varum have the appearance of curved, bow-shaped legs. In contrast, genu valgum, or knocked knee, is a condition in which the knees angle in and touch together when the legs are straightened. Despite the differences in shape, these conditions are relatively similar. Both bowleg and knocked knee are known to occur naturally in young children between ages two to five. This is part of a child's development process and the problem usually corrects itself over time. However, the condition may instead remain unchanged or even worsen over time. Leg braces are frequently used to treat bowleg and knocked knee in children. However, once a patient suffering from bowleg or knocked knee reaches adulthood, treatment may require surgery to properly correct the problem. The primary cause for bowlegs or knock-knees is due to genetics or from softening of bones during childhood. This can occur when a child has a deficiency of vitamin D, magnesium, phosphorus, or calcium.While those with bow legs may be able to walk without problems, the uneven stress on the knees can lead to accelerated arthritis. 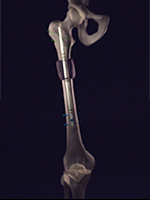 We perform a minimally invasive surgical procedure to correct the alignment and straighten the leg. Through a one half inch skin incision, the bone is partially cut and the leg is straightened with the help of an external fixator. The procedure takes about one hour and involves a one-night stay in the hospital. The external fixator is a scaffold on the outside of the leg that is applied through a few one-quarter inch stab wounds. This is used to help straighten the leg and to support the healing bone. This is a very functional treatment in which patients are encouraged to walk, put weight on their leg during the treatment. No casts are necessary, and exercise of the knee and ankle are encouraged during the treatment. We have noticed a dramatic improvement in pain that was localized to one side of the knee as well as improved function and appearance. With the legs are straightened, patients will often gain one-half inch in height as a bonus. So, whether it is for form or function, correction of mal-alignment is a minimally invasive procedure that makes people both feel and look better. The Limb Lengthening Institute of Los Angeles is a premiere surgical group and our experienced doctors are the only surgeons in the Los Angeles area who perform bowleg and knock-knee correction with the use of external and internal fixation.